Activists Go on Trial in Nevada for Protesting Obama Admin Drone Program | Democracy Now! AMY GOODMAN: We turn now to Pakistan. Millions of people continue to suffer one month after the torrential rains triggered floods that submerged one-fifth of the country underwater. But even as the disaster grips the country, the Obama administration’s drone war in northwest Pakistan is continuing. There have been at least nine drone attacks this month, the latest killing five people in North Waziristan Sunday. The United States has carried out at least sixty-three drone strikes inside Pakistan this year, killing an unknown number of civilians. Half a world away, at the Creech Air Force Base in Indian Springs, Nevada, is one of several homes of the American military’s aerial drone program in Pakistan and Afghanistan. Well, this week will mark the beginning of a trial for fourteen antiwar activists who held a ten-day vigil outside Creech Air Force Base last year. They were charged with criminal trespassing for entering the base with a letter describing their opposition to drone program. For more on the trial, we’re going to Nevada now, and we’re being joined by one of those on trial: Kathy Kelly. She’s been nominated several times for the Nobel Peace Prize. She’s coordinator of Voices for Creative Nonviolence. Kathy, welcome to Democracy Now! 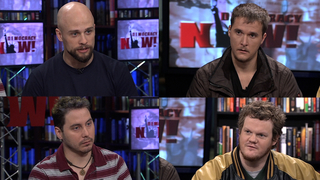 Thank you for joining us by Democracy Now! video stream. Why did you protest at Creech? KATHY KELLY: We vigiled and protested at Creech because we believed it was very important to call attention to the fact that the United States is, at an alarming rate, moving into robotic warfare, kind of a mission creep, that could lead us into perpetual war. There’s so little accountability. There’s so little information made available. And yet, as you mentioned, children are among those who are being killed. And this is happening with such regularity in Pakistan and Afghanistan. So we believe that we didn’t commit civil disobedience this time. Really, the fourteen of us who go on trial and who have expert witnesses like Bill Quigley and Ramsey Clark and Colonel Ann Wright believe that we were exercising our obligations under international law. It’s clear that targeted assassinations, these arbitrary killings, extrajudicial killings, are not allowed and that citizens have a duty, a responsibility, to prevent it. AMY GOODMAN: Can you describe exactly what you did, Kathy? KATHY KELLY: Well, we vigiled for ten days. I mean, the morning newspaper, the day that we entered the base, reported that we were going to do that, and so I don’t think it could have been a tremendous surprise. But as soon as we stepped onto the base, soldiers were very frightened. Two of them kind of clicked their guns. And so, when they said, “Stop,” we did. And then we remained — we had carried with us several letters. We had a letter that we wanted to circulate to base personnel and to Colonel Chambliss, indicating that we all share this responsibility to try to prevent the buildup of drone warfare and the killings that are happening so regularly. We had bread and water, and we would have liked very much to have a chance to talk with the base personnel. But after about an hour, we were arrested and taken into custody. The charges were dropped, and then they were reinstated. So this may indicate that there’s a desire to create a deterrent. There certainly is a constant construction. Our friends at the Nevada Desert Experience tell us that the cement trucks are arriving every day, and the space is being turned into a top security base. And it should be noted, I think, that in Ellsworth, South Dakota, Whiteman, Missouri, those bases are now developing the technology so that drone attacks can be operated by people inside of those bases, and also, of course, at Hancock Field, where people in Syracuse are demonstrating on a daily basis. AMY GOODMAN: You know, I wanted to bring in another guest into this discussion. As I was saying earlier, it’s been over a month since the floods began in Pakistan. Still, towns, villages remain submerged. Some 21 million people have been displaced from their homes, and the threat of forcing victims to stay outside their villages in camps or alone on roadsides. We’re joined right now by someone who has just returned from Pakistan. She has been working in the flood-ravaged areas. Her name is Feryal Ali Gauhar. She’s a Pakistani actress, filmmaker, writer, human rights activist. She served as a Goodwill Ambassador for the United Nations Population Fund and is the only UN Goodwill Ambassador who quit over the invasion of Iraq. Her most recent book is set in Afghanistan. It’s called No Space for Further Burials. Feryal Ali Gauhar, welcome to Democracy Now! It’s interesting to go from Kathy Kelly in Nevada, who’s talking about this protest at Creech, where one of the drone programs is based, to your experience of the flooded areas in Pakistan. Can you talk about the connection? FERYAL ALI GAUHAR: Well, yes, there is a very real connection, although that’s not the only element that we’re concerned about. But it is well known, if not acknowledged by — particularly by the state, that the base for the drones, where they’re housed before they are automated, is in Pakistan. The current government has literally gone blue in the face denying that. But I just happened to stumble across a contractor — and that’s not the Blackwater contractor — the contractor who built the base, who inadvertently, actually, spoke about it. But he was speaking about it in a different context, and that context was the fact that he was there at the time of the flooding — and, you know, this is the worst catastrophe to have hit any state since apparently biblical times. So, he actually mentioned to me that the River Indus, which is one of the largest rivers in the world, carrying now a volume of water which has not been known in contemporary history, was breached on the left bank deliberately in order to protect the base, which is on the right bank. And the breaching caused, consequentially, the inundation of an entire district, which resulted in the displacement of millions, not thousands, but millions, because we have 170 million people in the country, and this particular district is one of the most densely populated. So, yes, there is a connect between, you know, what is considered to be a natural disaster, but then the management of that disaster is not natural at all. FERYAL ALI GAUHAR: Oh, absolutely. In fact, it is a base where non-US military personnel are not allowed. In fact, the person I was talking who was there, who built the base, actually said to me that one of the reasons why non-US military personnel are not allowed is not just for security of the US military personnel, but because they do not wish to share the technology. They are — you know, we’ve had a long historical and political tie with the People’s Republic of China. And so, there is this fear that was expressed while the contractor was working on the base that the drone technology, you know, should remain specifically in the hands of the US military, and it should not be replicated by any other nation. So there is that protection of the technology itself. It’s not just the protection of the personnel. AMY GOODMAN: Where -— and for people who are very unaware, especially in the United States, of any geography outside of our country? FERYAL ALI GAUHAR: It’s — if you go along the River Indus, which stretches about 1,800 kilometers — and in miles, that’s about over a thousand miles — from the north to the south to the Arabian Sea. Jacobabad is named after a British colonialist, Jacob, and it is situated on the banks of the river between two provinces. The one province is Balochistan, which borders on — partly on Iran and also Afghanistan, and that is a very volatile border. And the other province is Sindh. So it is very strategically located, the base itself. Ordinary Pakistanis are not supposed to know about it. I’m sure ordinary Americans are absolutely unaware of it. But yes, there is a physical American presence. AMY GOODMAN: We had reports that both the water was diverted, which flooded further Pakistanis, and also that the US military had to refuse to allow it to be used as a staging base for aid. FERYAL ALI GAUHAR: Also, also true. Yes, that is also true, and which makes it even more ironic that, you know, in this so-called battle for hearts and minds — I mean, we all know that, you know, the agenda behind this very poetic sort of, you know, expression of hearts and minds, the agenda is really of violence and imperialism. And it is even more ironic that we have had many state — many visits by important personages from the United States government, including Secretary of State Hillary Clinton. And, you know, there is this desperate sort of a need to reach out to the Pakistani people. And the flood almost seems to have presented itself as an opportunity for American foreign policy to be accepted more readily by Pakistani people in exchange for relief. And, you know, relief consists of food aid, as well as shelter. But the irony is that, you know, while there is a physical military presence in the country, that is cordoned off and cannot be used for humanitarian purposes. So American forces and helicopters have actually been flying in from the Seventh Fleet into Pakistan and from other locations, possibly even from Afghanistan, because in 2005 during the colossal earthquake, which cost us 75,000 lives, we did have a diversion of the particular kinds of helicopters, which are the large — I think they’re called the Chinook, which was diverted from Afghanistan, from the duties there, which, again, is ironic — I mean, I just find things all connected — which is again ironic because at the time of Hurricane Katrina, the National Guard, who was supposed to have been protecting the American people, the National Guard was engaged in Afghanistan at that time, or in Iraq, one of the two countries. So, you know, you have this ongoing irony, series of ironies, where the state is meant to protect the people; it’s actually protecting only its own interests at the expense of the people. AMY GOODMAN: You were in Pakistan, and you are Pakistani, but you were in Pakistan with Palestinian doctors helping flood victims? FERYAL ALI GAUHAR: Yes, I was. I mean, for us, it was very — it was a symbolic presence, a very significant symbolic presence. The Pakistani people have been friends and supporters of the Palestinian liberation movement and the movement for self-determination of a sovereign people. And it was a very small team, six — four doctors and two medical technicians. And I felt that, of the foreign missions that had come — and there have been many, many, many — I have had a long association with the Palestinian movement, and I felt that this was my way of reconnecting with that movement. And my experience, of course, with the flood affectees was something else, which we can talk about if you like. But in personal terms, it was something I never expected, is that, as a result of my association with the team, I was then offered — and, in fact, given — the honorary citizenship of Palestine, which, for me, as a Pakistani, you know, is like — is like, for a lot of people, getting the green card to come and live in the United States. So I have had both a personal fulfillment and a political fulfillment in this experience. AMY GOODMAN: Well, I want to thank you very much for being with us, Feryal Ali Gauhar, a Pakistani filmmaker, writer, actress, human rights activist, served as a Goodwill Ambassador for the UN, the only Goodwill Ambassador to have quit over the US invasion of Iraq. She has written a novel about Afghanistan. It’s called No Space for Further Burials. This is Democracy Now!, democracynow.org, the War and Peace Report. I also want to thank Kathy Kelly of Voices for Creative Nonviolence for joining us from Nevada.